With all this talk of scientific advances and the need for complex calculations to run the machines of our daily lives in the future, it can make many people wonder. How am I going to be able to live in this rapidly approaching future? Will I be able to survive with my rudimentary tech/math skills? The answer, according to Pranev Mistry, is much simpler than you think. Act normal. 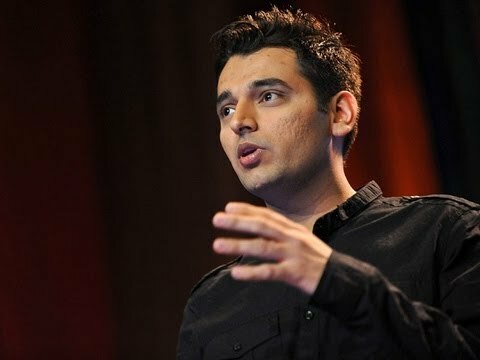 According to Mr. Mistry in the above video, the future will not be controlled by some person typing away at a machine (themselves becoming machine-like) it will be controlled by the everyday communicator who can see the world creatively and in a non-technical way. Using Sixth-Sense Technology, Mr. Mistry is able to take the complex processes for which we use a laptop, phone, camera, video player, camcorder, e-reader, etc. for and integrate them into one device that is controlled by the simplest, yet most complex of human evolution, gestures and communication. Imagine a world where if you want to take a picture, you hold your hands in the ubiquitous “picture frame pose” and boom, you have just taken a picture. Remember playing as a child and dialing your friend on your super fancy hand-phone? Well now you can do all this with Sixth-Sense. The video above is just the start to what will inevitably become the mainstream of the future, but this leaves us with a question. What in the hell does this have to do with the future of the Humanities? The world is becoming increasingly detached from itself. In terms of human interaction vs tech interaction, the tech side is winning and it is not helping us become all that we can be. Technology, in its form now, is a limiting factor to the human race. What Sixth-Sense promises to do is take the interactive element of humanity and apply it to everything. Imagine, in the classroom a teacher wants to demonstrate to their students what a dinosaur looks like. In this day and age, the teacher would need to have the data that they want already prepared to go along with their presentation. But what if Susie the Student wants to know what a pterosaur looks like (the teacher forgot to look up good images of a pterosaur) and the flow of ideas is interrupted and the teacher must go back to the computer and look up “P-T-E-R-O-S-A-U-R…SEARCH” and hope that there is a good image in the first few pages. With Sixth-Sense, our hypothetical teacher can freely discuss and allow the images to flow as they choose (or as Susie chooses) from the system. Translate this technology to any other area of human life that involves interaction with data and people and you can immediately see the ways in which effective communication is the way of the future. The leader/teacher/businessperson of the future is not going to be able to hide behind technology. They are going to be front and center communicating, explaining and demonstrating in a way that is only taught in a Humanistic approach to education.